Chrysanthemum flower (Juhua)-Chrysanthemum morifolium Ramat. Part Used & Method for Pharmaceutical Preparations: The chrysanthemum flower is gathered and then dried in the shade. 1. Wind-heat exterior syndrome manifested as fever, headache, chills and sore throat. Chrysanthemum flower (Juhua) is used with Mulberry leaf (Sangye), Mentha (Bohe) and Platycodon root (Jiegeng) in the formula Sang Ju Yin. 2. Wind-heat in the liver meridian or an upward attack of liver fire manifested as red, swelling and painful eyes. Chrysanthemum flower (Juhua) is used with Mulberry leaf (Sangye), Cicada slough (Chantui) and Prunella spike (Xiakucao). 3. Yin deficiency in the liver and kidneys manifested as blurred vision and dizziness. Chrysanthemum flower (Juhua) is used with Wolfberry fruit (Gouqizi) and Grossy privet fruit (Nuzhenzi) in the formula Qi Ju Dihuang Wan. 4. Hyperactivity of liver yang manifested as dizziness, vertigo and blurred vision. Chrysanthemum flower (Juhua) is used with Cassia seed (Juemingzi), Uncaria stem (Gouteng) and White peony root (Baishao). 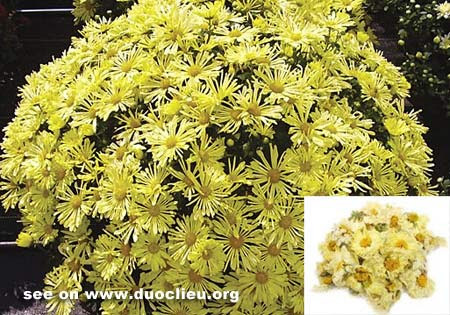 Cautions & Contraindications: The yellow chrysanthemum flower is mainly indicated in wind-heat exterior syndrome, while the white chrysanthemum flower is used to pacify the liver, expel wind and brighten the eyes.